//js.hs-scripts.com/4261871.jsPax South 2018 has come and gone. In my last post, I detailed my convention plans and itinerary. To the surprise of no one, I skipped all my planned panels and spent the day playing board games with friends instead. A weekend well spent! 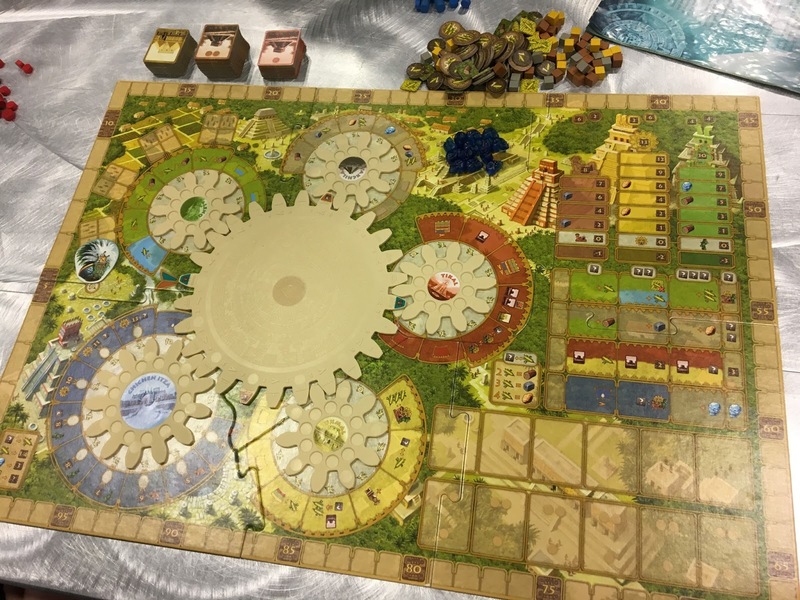 After wandering the exhibit hall and checking out the Tabletop Indie Showcase, we set up a game of Tzolk’in: The Mayan Calendar. This game surprisingly blew me away and I can see why it’s in the Top 50 on BoardGameGeek. 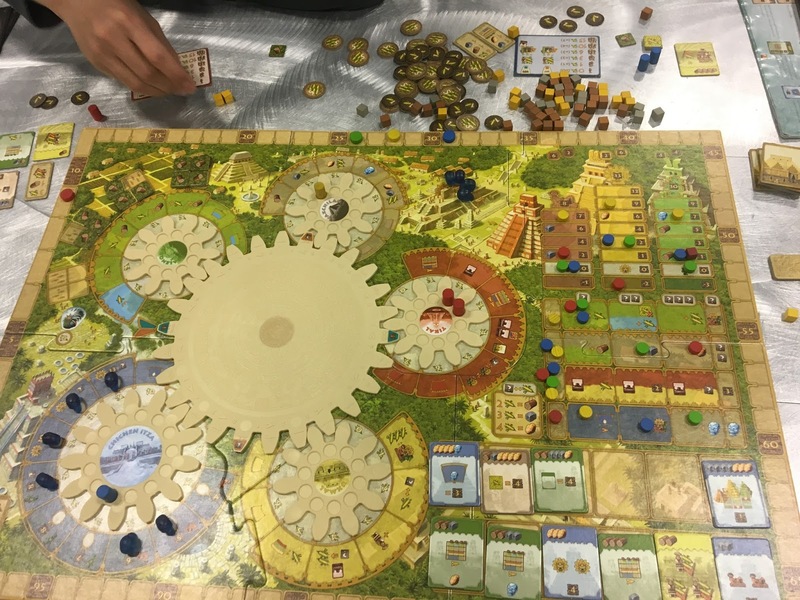 Worker Placement is not my favorite mechanic in gaming, but any game that introduces time as a resource gets a thumbs up! We had 2 veteran players teaching 2 newbies. In Tznolk’in, players take turns placing workers on spaces on gears or removing some workers for an action. Each space on the gear gives you a different action when you claim your worker. The 5 gears are connected to a central gear, and each round the central gear turns one tick clockwise. This also ticks up the connected gears. It takes planning and good resource management to be able to execute the actions you actually want, and there seem to be multiple viable strategies to get points. When the central gear ticks around enough times, the game ends. There are a lot of small moving parts and a bit of engine building. The moving gears is visually and strategically wonderful. 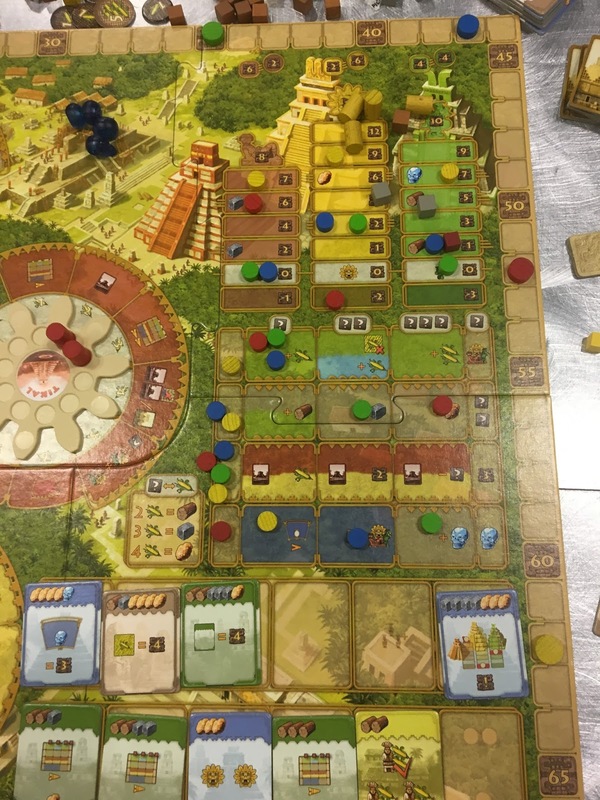 About 3/4s of the way through the game, I realized no one was making any big pushes up the Temple Track, and ended up winning the game because of the end game bonuses there. It’s a neat game that I will definitely play again if given the chance, but not one that will make it into my collection. Not bad for my first game! After lunch at a surprisingly average Mexican restaurant on the Riverwalk, we played a new game that a friend bought at the convention: Bargain Quest. 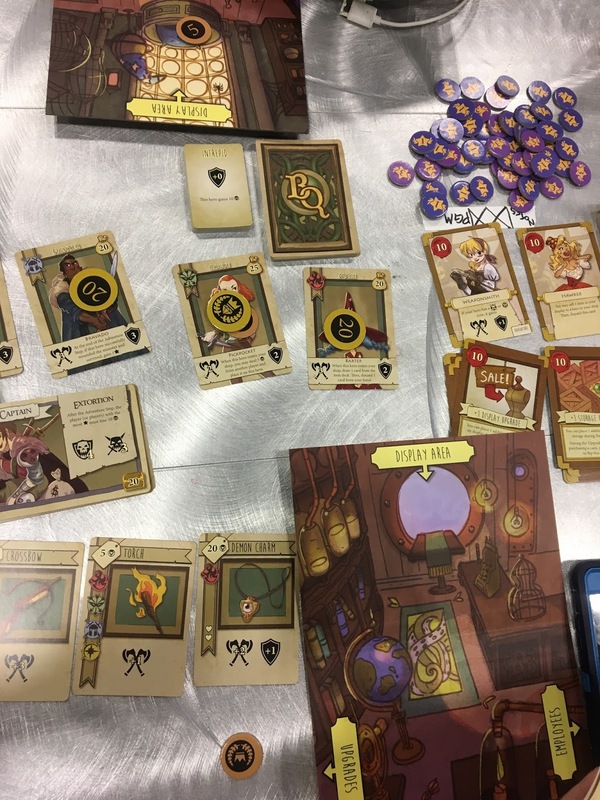 Bargain Quest had a successful Kickstarter and had excellent production value. You don’t always get excellent production value from Kickstarter games. Selling my magical wares to adventurers. Bargain Quest takes a traditional fantasy trope of adventuring heroes and turns it sideways. Instead of playing the powerful mage, sneaky rogue, or fearless fighter, players take on the role of shopkeepers selling magic items to the the adventurers. I love it when games take an easy theme and change it to be fresh. Players acquire their items through a draft. After you draft your items, you set one on display to attract a specific adventurer to your shop. Then, you sell that adventurer what you can from the remaining cards you drafted, and wish them well as they go off to battle the nefarious monster. You get points if your adventurer lands a hit, survives, and/or kills the monster. Bargain Quest has a lot of neat ideas and some mechanics that I really enjoy in other games, but the end product did not fully come together for me. The attract customers mechanic is similar to an idea I never got into testing mode about running a lemonade stand, and drafting is always fun. The only player interaction in the game was reading the draft signals, and I felt there were some missed opportunities for more. 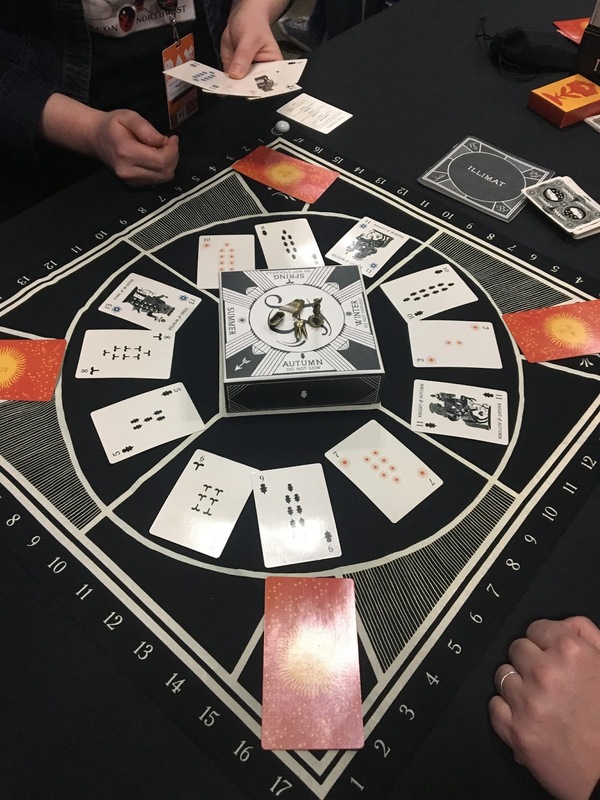 The final game we played was at a demo table for Illimat. Illimat builds upon the core game of Scopa, a classic Italian card matching game traditionally played with 40 cards. Illimat introduced an extra face cards and a 5th suit for 4 players, some restrictions on when and how to pick up cards, and some new end game scoring. The goal of the game is to collect points. You collect points by capturing the most total cards, having the majority of a particular suit, and a few other ways. There are 4 sections on the board, each with 3 face up cards. On your turn, you play 1 card from your hand, and either collect all the matching number cards from one section, or enough cards to equal the number that you played (You can grab a 2 and a 6 with an 8). You can also build up other cards (playing a 3 on a 6 to form a 9). The rule additions were nice, but I’d rather just play Scopa. We also never really understood the theme of Illimat. A good theme, like a good rug, can really tie the game together. Here, it felt disconnected from the game play. The highlight of Pax was the Saturday night video game concert. 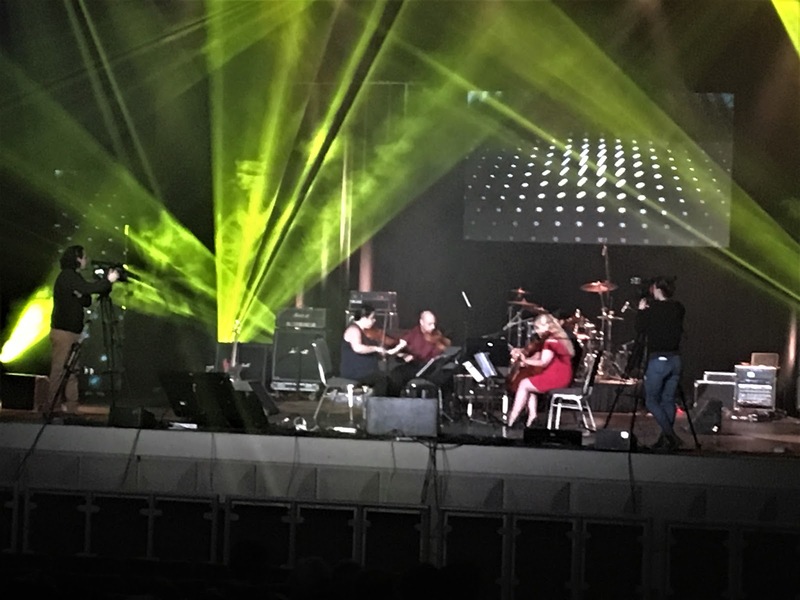 A string quartet played some lovely music from The Legend of Zelda series (complete with ocarina! ), Chrono Trigger, Halo, and other games with great soundtracks. It was really enjoyable. The next act up was Bit Brigade. I had heard of Bit Brigade before; they are a rock band that plays the soundtrack to a game that one of the members is playing live on stage. This concert, they played to the Legend of Zelda on NES. Since that game only has 3 tunes in it, they jammed in as much Zelda music from other games in the series. Man, that is a series with some great music. It was really cool to see the band sync up the Triforce music when the player grabbed the Triforce at the end of each dungeon. The schedule had Super Mariachi Brothers as an act, but instead of getting serenaded with Mario music, the final act was a rap ensemble. Not my cup of tea, so i left a little early. The Chocobros is a great name though. Pax South is a fun convention. The crowd size is manageable, the board game area is pretty good, and the there are some great cosplayers. 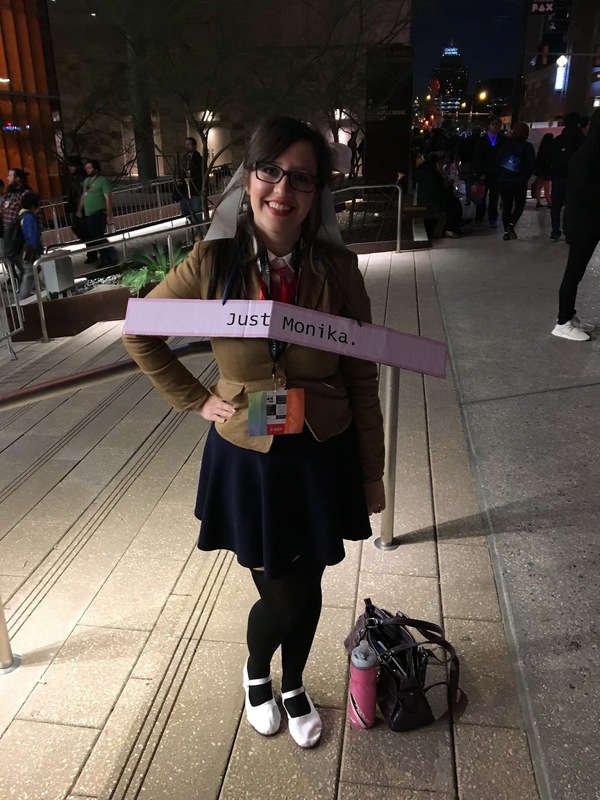 Just Monica from Doki Doki Literature Club made me laugh out loud! The real highlight was seeing old friends and getting some quality gaming in. See you next year, San Antonio! Next January 2018 Wrap Up – Charterstone, Instagram, Streaming on Twitch, Prototypes, and More!